Never Enough Nails: Two SinfulColors Crystal Crushes Pretties! I'm really excited to show you these two new SinfulColors texture polishes today! They are two of the eight new texture polishes from the SinfulColors Crystal Crushes collection. This sparkling matte sea foam green is SinfulColors Treasure Chest. My pictures unfortunately make this look more blue than it really is. I would say it's more of a slightly blue-ish sea foam green with some golden sparkle visible in some lights. I think it's prettier in person, for some reason I couldn't really capture how nice this is! It is definitely unique in my texture polish collection. This is two coats of Treasure Chest and it had excellent pigmentation. I probably could have done one coat, but I wasn't expecting it to be that opaque right off the bat. The formula was good, maybe a tad on the thicker side, but it didn't cause any problems for me. OMG YESSSSSSSS a yellow texture!!! Now, I know there was that elusive random NOPI yellow texture that supposedly exists, but I never found it and I've been dying for a lemon yellow texture polish. I am happy to say I now own one, the lovely SinfulColors Face the Facets. 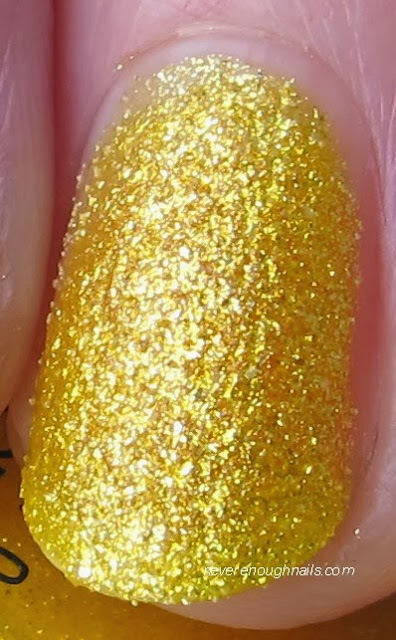 SinfulColors calls this "banana bling", but I always imagine "banana" to be a slightly paler yellow, so I'm going with lemon. I looooove this polish! I love yellow polish anyway, and this sparkling yellow texture is just what I've been looking for! This is just two coats of Face the Facets. It was nicely pigmented, not an almost one-coater like Treasure Chest, but it was perfect in two coats. The formula was excellent, a bit thinner than Treasure Chest and I think that makes it even easier to apply. After trying these two SinfulColors Crystal Crushes, I will definitely be hunting down a few others from this collection. There is a blue that looks like I need it, and a green as well, so sign me up for that! These are $2.99, a steal for an awesome texture polish, and are available exclusively at Walgreens.